TomTom has announced that it will be bringing a turn-by-turn App to the Apple iPhone. With a minimal interface with easy to press buttons and a windscreen mount that works in both portrait and landscape TomTom will be the first to bring proper GPS to the party on the iPhone. 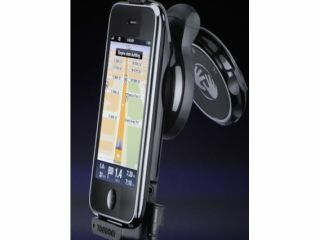 The dock also features a GPS enhancer, power connection and a loudspeaker to hear the female voice. Other announcements of note making use of the new iPhone 3.0 OS were a medical application that allowed doctors to monitor their patients from remote locations and an eBook application called Iceberg to rival the Amazon Kindle. The medical application, from AirStrip Technologies allows doctors to measure patient heart rates from afar. It gives a real-time stream of the data, and even allows doctors to rewind the heart monitor and check the distance between heart rhythms using pinch and zoom. The Iceberg application is an 'in-App book store' which brings 500 best-sellers, 50 major magazines and 170 daily papers (likely in the US) as well as 1 million books from ScrollMotion's iPhone books store.